After centuries of unremitting hostility between warring species - There is now peace throughout the Far Space Federation. You are hereby requested and required to assist the Federation. Your mission, as a new recruit, is to supply our crew with vital materials to preserve the truce, tranquillity, and order in the Federation. 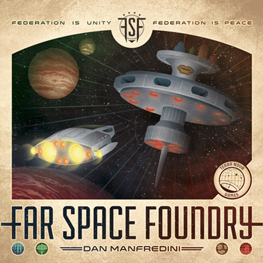 In Far Space Foundry, you will lead a team of pilots through two distinct phases - Space Foundry Alpha and Space Foundry Beta. At Space Foundry Alpha, you will manage the transit, storage, and processing of asteroid ore in your warehouse - all while swindling with the Galactic Traders and hiring the expertise of veteran pilots from the Alpha Cantina. At Space Foundry Beta, you will utilize the ore you transported from Space Foundry Alpha to manufacture and charge finished products, as well as upgrade your fleet. The recruit that can best load their freighters to supply our troops on the front lines will lead our mission to success.